Twenty-year-old Tyler Denton earned Garry Monk’s admiration for a “debut goal you’d never forget” after his brilliant strike steered Leeds United through a hard-fought League Cup tie at Luton Town. Denton, who has been with Leeds since the age of seven, marked his first senior appearance with a deft 20-yard finish on 23 minutes, earning a 1-0 win at Kenilworth Road and edging Leeds into the tonight’s third-round draw. 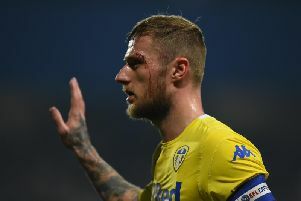 The defender was among 11 changes made by Monk after Saturday’s Championship win at Sheffield Wednesday, brought in as a replacement for established left-back Charlie Taylor. His sublime effort was the difference on an night when Leeds survived a late onslaught from their League Two hosts. “What a great goal that is,” Monk said. “That’s one debut goal you’ll never forget. He’s been great in pre-season and he’s a typical example of what they do at Leeds with young players. Monk is expected to recall Taylor and most of the other players rested yesterday when Leeds travel to Nottingham Forest this weekend. The United boss played down the suggestion that Denton might keep Taylor out of the side, saying: “Come on, he’s only played one game. Monk, meanwhile, said the spate of alterations to his line-up at Luton had been the result of fatigue after Saturday’s victory at Hillsborough. “It’s not that I wanted to (make as many changes) but I had a look at the players in training and I felt the ones who played on Saturday weren’t sufficiently recovered,” he said. “We’ve had a lot of games in a short period and on Saturday we sacrificed a lot physically. It would have been wrong for me to play them.